(Cheval Live) Tsukasa Suou - Special Event, "Knightly Costume"
I "Witch" You A Happy Halloween! One weekend, ALIVE units SOARA and Growth visit a kindergarten for work, but something strange happens... If there are any corrections needed, feel free to let me know and I'll fix them asap! --It's the weekend. Where are members of SOARA and Growth heading to? Ryota: ...I was told we were helping out at a kindergarten class this time, so is it around here? Morihito: The map says it's close. We're sure to get there soon. Sora: A kindergarten music meetup! Sounds fun! Nozomu: It's okay! It's okay! They definitely will be! Hello hello hello! I was requested to translate Keito's solo from the Akatsuki album, so I did! It's a really beautiful song, and I did my best to capture that in the translation, too. As always, if there are any mistakes or anything that could be translated better (especially more poetically), let me know! A big thank you to Keru, who proofread this for me, and Vienne, who helped me with a particularly difficult line. As a heads up: this entry is definitely image heavy. As a heads up: this entry is slightly image heavy. Tsukasa: Good morning, Oneesama! Fufu. Let's work well together today... Uweeh? S-Sorry, I made a weird sound... U-um, what's that? Tsukasa goes to 2-B to find one of his seniors to give him some study tips, but... Thank you Euni ( yuni_ut) for proofreading this story, as well as a few of my friends who are much better than me at this for some tips regarding translating a few lines! Tsukasa: Senpai! Please tutor me! 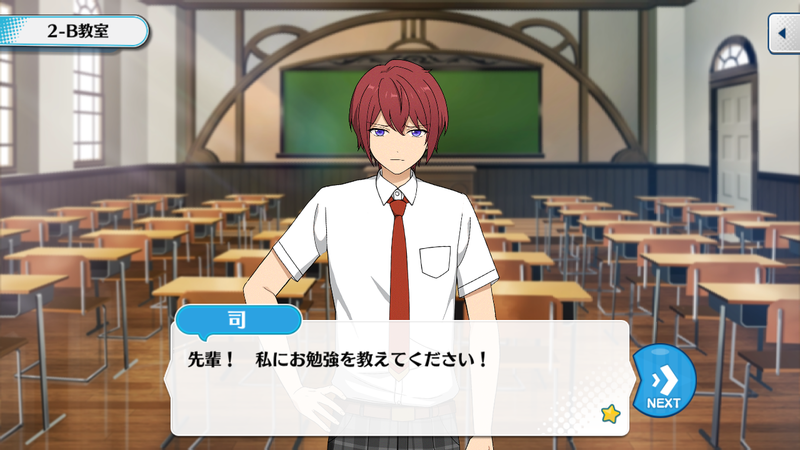 Tsukasa: I wasn't expecting anything from you! Hm, is Narukami-senpai absent? This is classroom 2-B, correct? 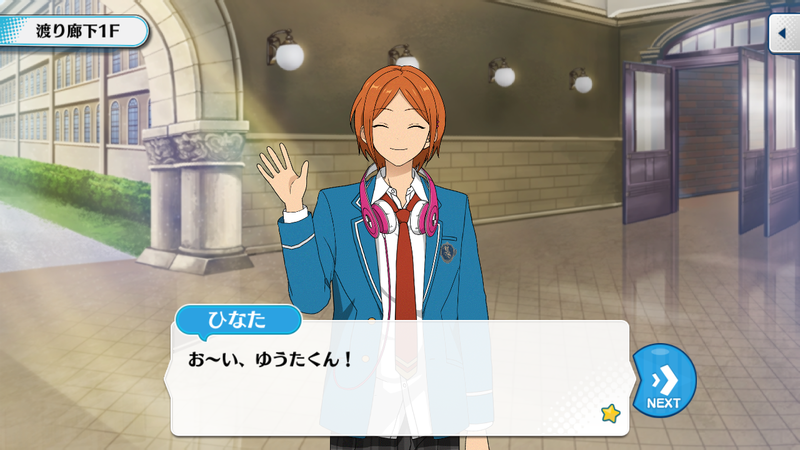 Ritsu: Ahhh, Nacchan huh~... Nacchan said something about having modelling work to do with Secchan. I think they’re both gonna head straight home once they’re done, so Knights is taking the day off, yeah? 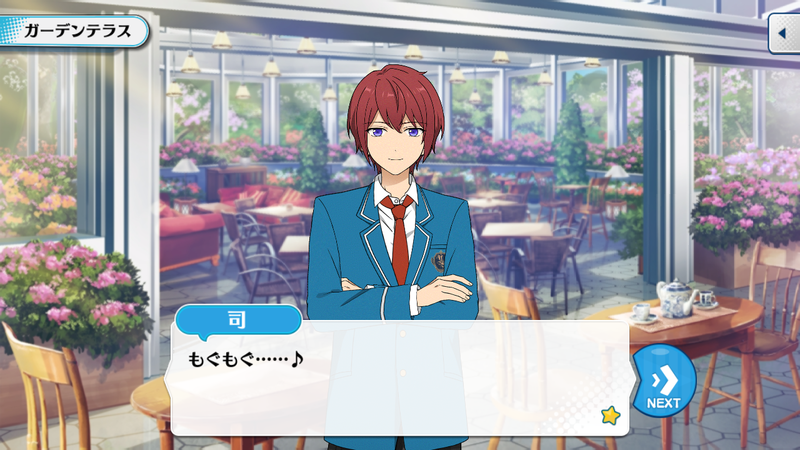 Tsukasa: Eeh? Well, there’s no helping it if they have work, but I'd like to be told about this sort of thing beforehand! I feel like I'm always being treated as some sort of underling, or rather, I'm being made light of! Since these are so short, a small compilation of spot talks! Find them in the comments. Ryuseitai and 2wink come together for a quick strategy meeting regarding the Live, and reach a consensus on what they should do... A massive thank you to Euni ( yuni_ut) for helping out and proofing this for me, as well as pointing out some mistakes! Tetora: Oh yeah, this work is for a Live on a ship owned by the Suou family, right? Shouldn’t he be included in the briefing? 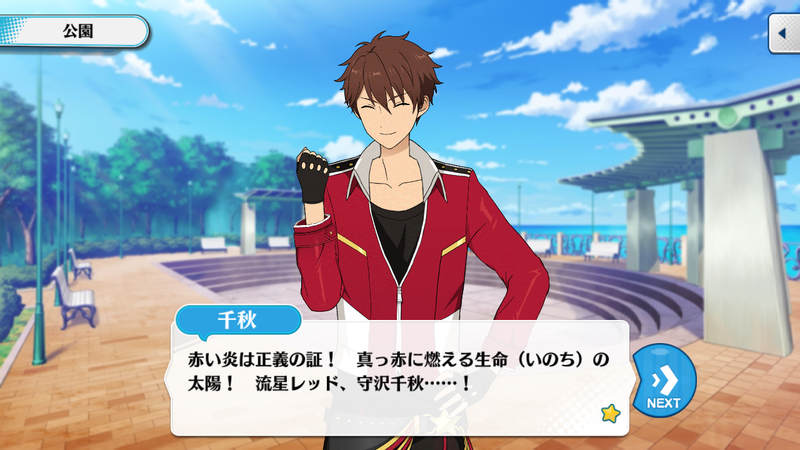 Chiaki: The red flames are the mark of justice! Burning bright red, the sun of life! Ryusei Red, Morisawa Chiaki...! As Sengoku isn't here! The yellow flames are the mark of hope! A single miracle shining into the darkness! Ryusei Yellow! Sengoku Shinobu...! And as Kanata isn't here either! The blue flames are the mark of mystery! The blue planet, shining within the universe! Ryusei Blue, Shinkai Kanata...! A huge thank you to Euni ( yuni_ut) for proofreading this for me and giving me a few pointers! The Aoi twins sure do have the highest luck stat in all of Yumenosaki, don't they. It seems like Ryuseitai's got work to do, but Kanata's no where to be found... Thankfully, we have Shinobu Sengoku on the case. As always, thank you to Karen ( yui_narita) for proofreading this for me, to Keru for helping me on some difficult parts of speech, and to Euni ( yuni_ut) for giving it some final editing! 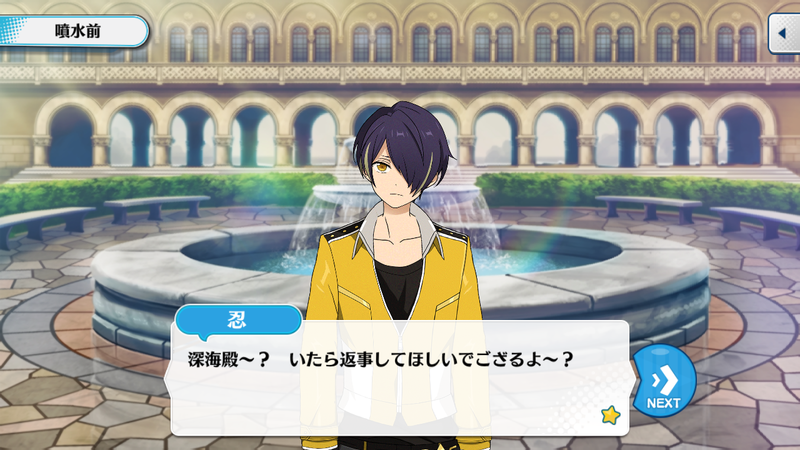 Shinobu: Shinkai-dono~? If you're here, I would like a reply de gozaru~? Does anyone else have a small existential crisis every time they think about how big the Suou family cruise liner is......... A huge thanks to Karen ( yui_narita) as always for proofreading and editing this, and Euni ( yuni_ut) for giving it some final editing! Hinata: So, so? Is it good? Tsukasa: Mm, it's very delicious. I’m happy that I finally got to eat your sweets. Ever since I heard from Yuta-kun that making sweets is your hobby, I’ve thought of wanting to try them if the opportunity arose. A collab between Peace ( ekstermi) and I! Special thanks to Vie ( angelsbouquet) for proofreading these for us. [Unit song] Grateful Allegiance: Giving the feeling of "dashing ahead," this dramatic track is brimming with what defines "Knights". Don't miss the lines filled with each of their gratitude! 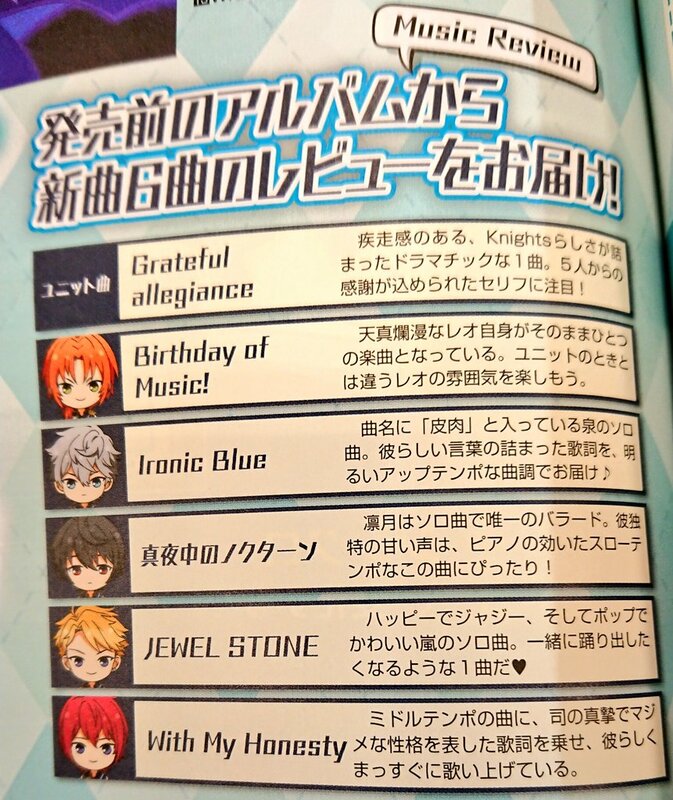 [Leo] Birthday of music! : The innocent Leo himself is within this piece of music. 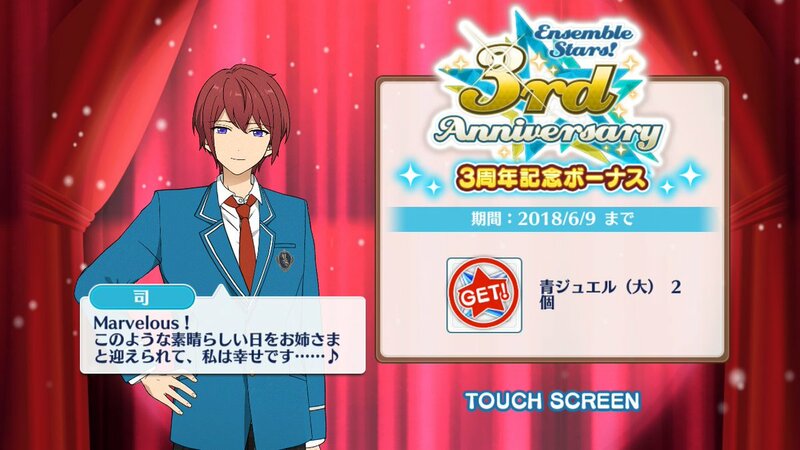 Let's enjoy a Leo-like atmosphere that's unlike his unit's. [Ritsu] Midnight Nocturne: Ritsu's solo song is the only ballad. His uniquely sweet voice suits the piano's slow tempo perfectly! [Tsukasa] With My Honesty: A mid-tempo song, the lyrics were written to show off Tsukasa's serious and sincere personality. He sings them straight from the heart.